We do not STOCK any items shown here. 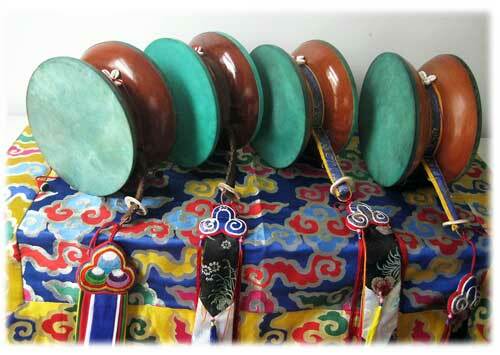 ALL items are CUSTOM FABRICATED or custom ordered on request.This includes SengDeng Chod Damaru from 8″ to 10″ in diameter. Zabshing (Bawa) Damaru are super light weight, made of the burl of the tree, but are more expensive. Please contact us with your request and for current prices, as they can fluctuate. Occasionally we receive special or extra items, and if so these are listed here on a monthly basis. Click on the Gallery of your choice. Click on each picture individually or cycle through the slides. We update this gallery regularly with new shipments and availability! Damaru are more than musical instruments. The Chod damaru embodies the blessings, power, lineage of the path, and is the dwelling place of the yidam, the dakini, the protector and the mind of the lama. All these damaru are made in adherence to the strictest standards as required by the ancient oral and written traditions of tantric, Vajrayana practice. Specifically, the shape, size, and many material requirements of the damaru, come directly from MaChik Labdron and subsequent masters of the art of Chod. Specific qualities and requirements of damaru fabrication can be found here. 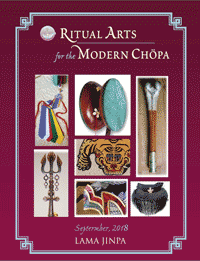 If you wish to understand the art and spiritual practice of Chod, please visit our sister site, the School of Tibetan Healing Chod.